When your children became father or mother, a new series of relationships begins, one involving parents and children—but let’s not overlook grandma and grandpa relationship." However, being a grandparent involves more than occasional babysitting. The long-range effect on the grandchildren of things said and done, and the position of the parents, need to be considered. As is true of all relationships in this age, there can be problems, pitfalls and, sometimes, heartaches. 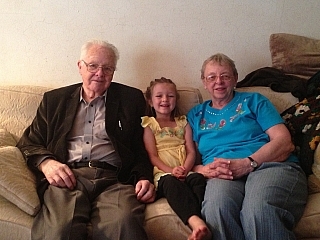 To be a respected grandparent (for you cannot be loved on demand) offers a challenge. Together, let’s consider the art of being a grandparent. How often have you heard the lighthearted statement, “Oh, their grandparents spoil them”? In affluent countries, it is not uncommon to enter the room of grandchildren and find a veritable toy-land of mechanical or cuddly creatures and even personal TV sets. Later there may be trail bikes, motorbikes and, as the children grow older, automobiles. In time it becomes evident in many such cases that, while there is happiness in giving, there is sadness in spoiling. But when you give, you do well to try to make it something lasting, something that will contribute to the child’s mental or emotional development and, in most cases, something not too expensive. Along with other things, you may need to give more of yourself and your time. Doing this with success requires communication. Early communication is necessary, and not very difficult, for little is expected in the way of a reply from babies. Progressive communication through the teen years and into adulthood offers more of a challenge. The “gift” of time plays a large part in communication. As grandparents, you need to take time to listen to your grandchildren’s problems and adventures of daily life. This is important to the development of their personality and lets you know where some kindly help might be offered. Now, what if you learn that something your grandchildren have done is not so upright? Scheming with them to hide it from their parents is surely no way to help them. On the other hand, getting excited, shouting and scolding is not a good way to communicate. They are going to make mistakes—perhaps some of them serious—even as we have done. Can you use these as opportunities to reason with them, to readjust their thinking, to help him to grow? Do I talk with my grandchildren, not at them? Is my conversation based largely on do’s and don'ts, or am I a good listener and then do I give reasons and explanations?" As appropriate, share life’s experiences with grandchildren, your failures, your joys, your love for them. Walk in the countryside together, by the sea, in a park or the garden. Be observant and talk together about wildlife, the seasons, life’s dangers and life’s blessings. A memorable occasion in the life of one grandparent occurred during a walk in the local park with his four-year-old grandson. At the base of a tree a large winged insect lay dead on the ground. The young boy was afraid of the insect. The grandparent picked it up, and a simple discussion of the subject of life and death ensued." Are you looking for something that would interest your grandchild? What boy is not attracted to grandpa’s tool-shed, with its array of hand and power tools, items collected over the years? The opportunities to share in a special project of mutual interest are many. And let us not forget grandma’s sewing room or kitchen. What little girl is not attracted by the colored cottons and fabrics, and the desire to make a doll’s dress, and, later, perhaps one for herself? As time passes, perhaps grandma can also share with her the secrets that she has learned about cooking. Are You Patient and Tolerant? There is a saying, “You can’t put an old head on young shoulders.” Handling successfully the problems that arise between young and old takes patience and tolerance, and today’s society is experiencing a famine for both. Young folks are often strongly influenced by the world around them. There is a natural desire to be accepted by their peers. They may feel that their parents stand in their way. As a grandparent you can help with this problem. Since you are not usually so directly involved in the day-to-day matters of family discipline, the children may be more inclined to take to heart what you say. It often helps if you share with them some of the problems that you had along the same line in our youth. However, in some matters you may find that you do not see eye to eye with your children in the way they are handling matters involving the grandchildren. Damage to a precious relationship can occur if you as a grandparent, even with good intentions, always meddle with the family affairs of your children. It is indeed difficult to manifest patience and tolerance when you see situations develop that could lead to sadness. Yet if you as grandparent are to be respected, you must appreciate your proper role relative to the family circle, not trying to take the role that the parents properly fill.